Big day for the Celtics. Kobe is in town. What better timing for the old school rivalry to reunite than after Kobe passes Shaq in scoring for LA and just days after Pierce passes Bird in all time scoring for the C’s. It’s only fitting the two key figures in the new school rivalry make headlines just days before they go head to head for the first of two matchups the teams have together this year. Everyone’s been ripping on the C’s and how they’re old and finished, but the boys in green have turned things around lately, winning their last 5 games and 9 of their last 10. Not too bad for an aging team huh? They’re sneakily only 3 games back of Philly for first in the Atlantic Division. Kobe and the Lakers of course aren’t the same team as three years ago, but I think it’s safe to say Kobe hasn’t lost his touch. He hasn’t exactly taken the #7 pre season player ranking by ESPN too lightly, proving he’s still in a league of his own. And that’s coming from a Boston fan. Regardless, the Lakers have lost their last two and sit with a 3-9 record on the road, while an impressive 11-2 at home. The Celts have moved up to 14-10 and are 10-6 at home on the season. But let’s be real, we all know when it comes to these two teams, records don’t mean anything. They’ll be going at it like it’s the 2008 playoffs. For our sake, hopefully more like Game 6. 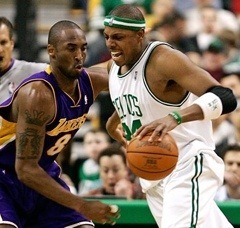 This entry was posted in Celtics and tagged Atlantic Division, boston celtics, boston sports blog, Kobe Bryant, LA Lakers, Larry Bird, paul pierce, rivalry, Shaq by jtulz07. Bookmark the permalink.